Pre-order UFC Undisputed 3 (First Run Only! 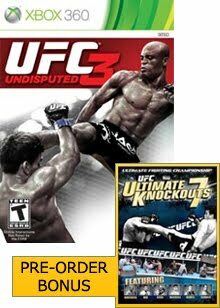 UFC Ultimate Knockouts 7 DVD Included)- 360 (Preorder) before Feb 1st, 2012 and receive a FREE BONUS copy of the DVD UFC Ultimate Knockouts 7 with your pre-order. This is a $19.99 added value! Nothing thrills fight fans more than a devasting knockout. Ultimate Knockouts 7 has more explosive finishes in one DVD collection than ever before.